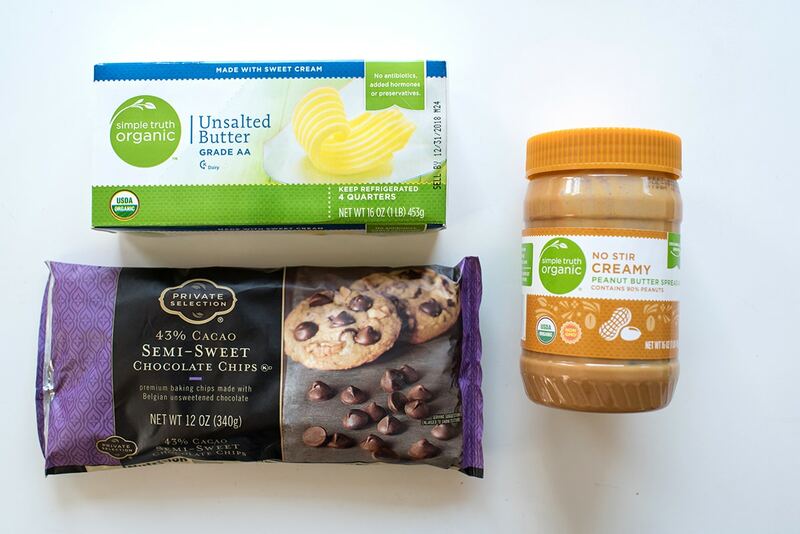 It’s no secret that peanut butter and chocolate is one of my very favorite combinations. The other is 54-32-27… that’s the code to the Master Lock on my front door! 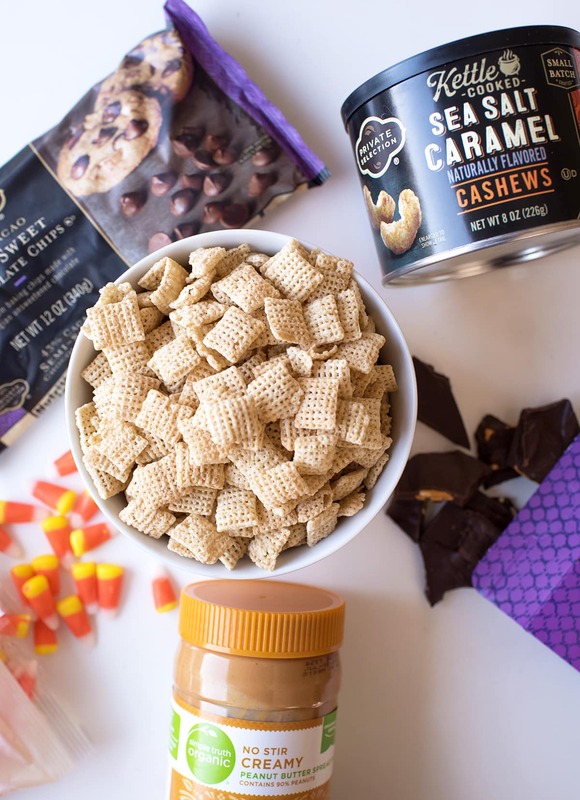 If you’re looking for an easy Halloween recipe or a recipe to use up all of your leftover Halloween candy, this Halloween Puppy Chow is just the thing. 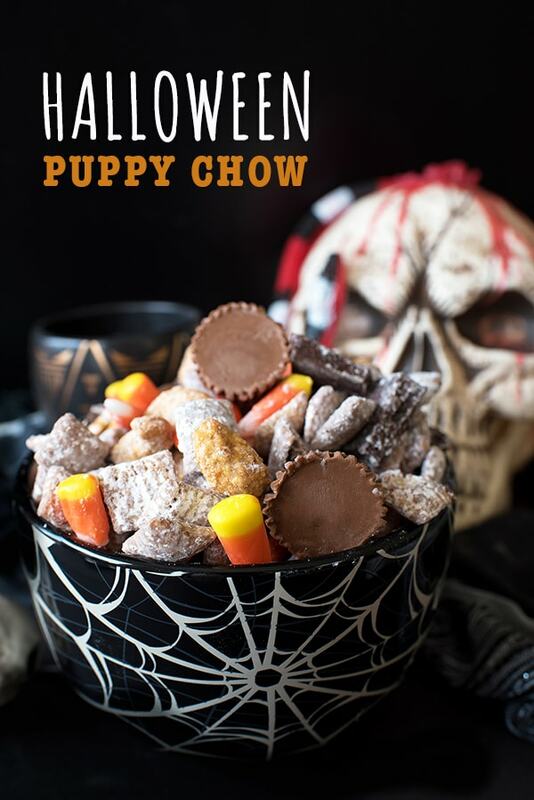 For this puppy chow – or muddy buddies if you prefer – I took the classic puppy chow recipe: peanut butter, chocolate, butter, powdered sugar, and added my favorite Halloween candies! Puppy chow is a really easy recipe to make. Some might call it foolproof. However, the first few times I made puppy chow, I struggled a little bit with getting it in the bag and not covering my kitchen in chocolate. I realize this is actually pretty easy to do, unless like me, you’re 95% Swedish Chef. In which case, you might as well start your baking process by painting the kitchen in chocolate. It’ll get there anyway. This time around, I tried a different approach. Instead of placing the rice cereal in a bowl and coating it with the melted chocolate-peanut butter-butter mixture, and then transferring that sticky concoction to a bag, I started by putting the cereal in the bag and pouring the chocolate mixture on top. Let me tell you, this approach is much less messy. Also, the last time I made this, I had access to a microwave. Not so much this time. But that’s ok, you can melt the chocolate, peanut butter, and butter together in a double broiler (or a metal bowl set over a saucepan with an inch of boiling water). It works just as well. Once the mixture is fully combined, pour it over the cereal without getting any on the counter. Now that you’ve wrangled the chocolate into the bag, seal the bag and toss the bag gently to coat all of the cereal that’s inside. Then, open the bag, add one cup of powdered sugar, reseal, and toss gently until everything is coated. 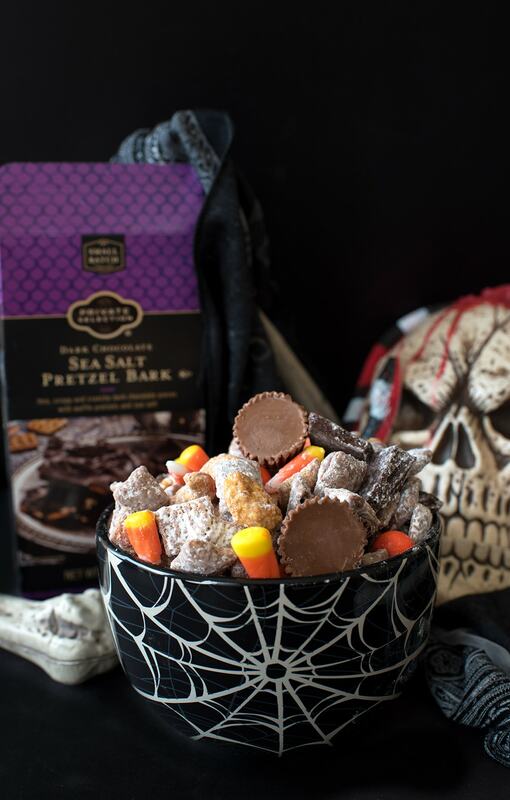 For this Halloween Puppy Chow, I stuck with classic Halloween colors but made sure to add mix-ins that had a variety of textures, including candy corn, Private Selection Kettle Cooked Sea Salt Caramel Cashews (these are totally addictive, you’ve been warned), chocolate pretzel bark, peanut butter cups, and more. Use good chocolate! You are going to taste the chocolate, so you want to make sure to get the good stuff. I used Private Selection semi-sweet chocolate chips for this recipe because it’s rich and delicious, but Private selection makes a delicious dark variety as well. It’s all about personal preference. Both are available at Ralphs, part of the Kroger Family of Stores. Same goes for peanut butter. I used the Simple Organic creamy peanut butter for this recipe because I love the flavor (seriously, do not leave me in a room with this and a spoon), but you could also use almond butter or cashew butter! Either way, using creamy vs crunchy nut butter is key. Place the cereal in the bag before adding the chocolate mixture. Strain out extra powdered sugar. This step is totally optional, but will help your toppings stand out. I put the muddy buddies in a metal sieve and shook gently until I had removed the extra powdered sugar before adding the candy and nuts. Don’t skimp on the toppings! Muddy Buddies are great all on their own without them, but they’re what make this so fun! 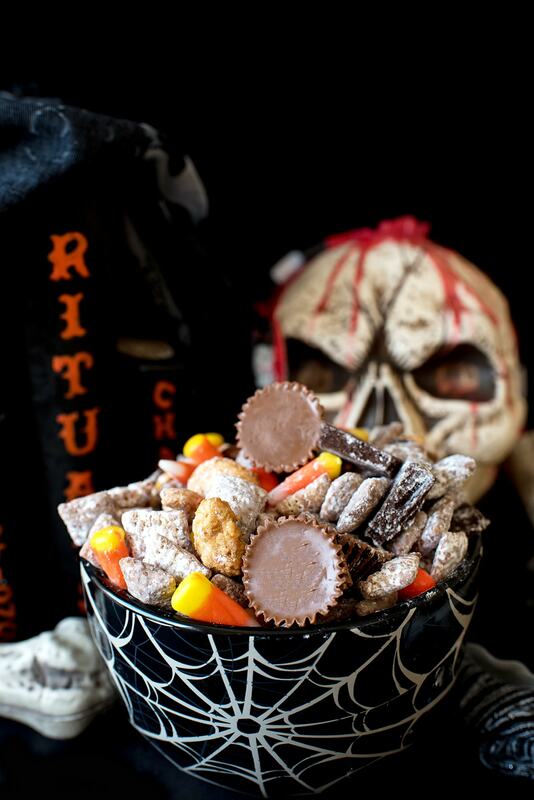 Chocolate, peanut butter, and all your favorite Halloween candies combine to create this spooky Halloween Puppy Chow! Place cereal in quart-size or larger resealable bag. Place chocolate, peanut butter, and butter in double boiler. Heat until combined, stirring continually. Pour chocolate mixture on top of cereal, seal bag, and toss gently. Open bag and add powdered sugar. Reseal and toss gently. Pour mixture onto baking sheet and toss with your favorite toppings. Oh my goodness… what a perfect treat to serve the kiddos on Halloween before they start trick or treating! Totally making this! This is a great treat for the kids to enjoy over Halloween! Even better for the parents to enjoy after Halloween using up the kids’ candy! They will never know right?! I actually just bought a can of the sea salt caramel cashews. They are delicious! I really love this amped up Halloween muddy buddy mix that you created. Looks so good! Aren’t they so good? I have a few left over from making this recipe and it’s taking all my willpower to not eat them in one go! What a lovely combination of sweetness! We enjoy Halloween in our house and love to make new recipes each year. I have never had/made a puppy chow muddy buddies recipe, but I think my kids would love this for the holiday – so fun!